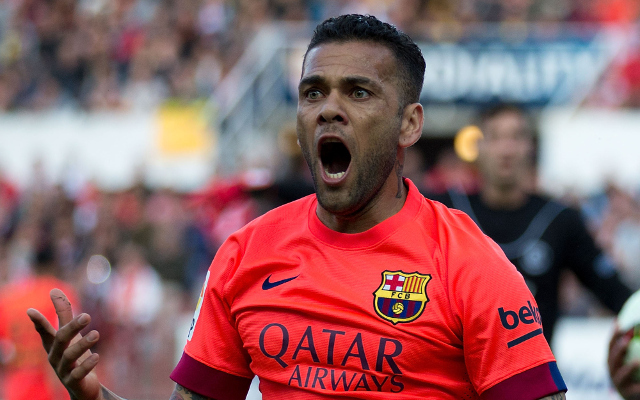 Barcelona contract rebel Dani Alves is reportedly on the verge of committing his future to the club, dashing Manchester United’s hopes of snapping him up on a free transfer. According to radio station Cope, the Brazil international has had a change of heart about departing the Nou Camp and has now opted to stay, with one major factor in his decision said to be the fact his children will not have to move to a new country. United, who are keen admirers of the 31-year-old according to the Daily Mail, had hoped to capitalise on a breakdown in discussions between his representatives and the La Liga giants. He would not have commanded a transfer fee and the Red Devils were capable of meeting his salary demands. While a deal is not completely dead in the water until Alves has signed on the dotted line, the latest update from Spain represents a setback for the three-time European Cup winners and boss Louis van Gaal who will be looking to put plans in place for the summer transfer window.